A selection of office spaces is available to let in this brand new building, conveniently located in Toronto and excellently served by public transport. Fully furnished with great attention to details, these offices are equipped with the latest telecommunication and IT solutions. They are provided with printer and copying facilities, kitchen and lounge areas, managed reception area and secretarial and cleaning services to assist your daily business. These Class AA, high-end executive suites are now available in vibrant downtown Kitchener. All-inclusive business service comprises cutting edge technology, use of fully equipped boardrooms and tailored virtual office packages. These sophisticated offices are ready to lease in a fantastic selection of sizes. Highways 85 and 401 are only seconds away for easy access to the rest of Ontario. This location offers premium coworking desk and serviced office space, setting itself apart from the competition. This center is located near many of the area's attractions, restaurants, and local transportation stations. Memberships include fully furnished office space with a long list of amenities. This center aims to focus on growth, innovation a discovery. 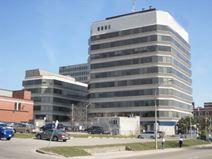 This modern office space is directly located in the Kitchener market. A modern and exquisitely furnished 12-storey business center could be the home of your new flexible office space, with exquisitely furnished suites available fully equipped and at exceptional value for all professional clients and prospective tenants. An elegant piece of architectural design at the historic crossroad, around which the city of Kitchener was developed, this commuter friendly location is close to the University of Waterloo and provides a great impression to your clients and corporate visitors to the site alike.